Episcopalians worship in many different styles, ranging from very formal, ancient, and multi-sensory rites with lots of singing, music, fancy clothes (called vestments) and incense, to informal services with contemporary music. Yet all worship in the Episcopal Church is based in the Book of Common Prayer, which gives worship a familiar feel, no matter where you go. 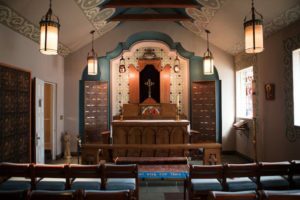 Worship in the Episcopal Church is “liturgical,” meaning that services are organized around a set form of rites or ceremonies. Our services and prayers don’t change greatly from week to week. This sameness gives worship a rhythm that becomes comforting and familiar to worshipers. 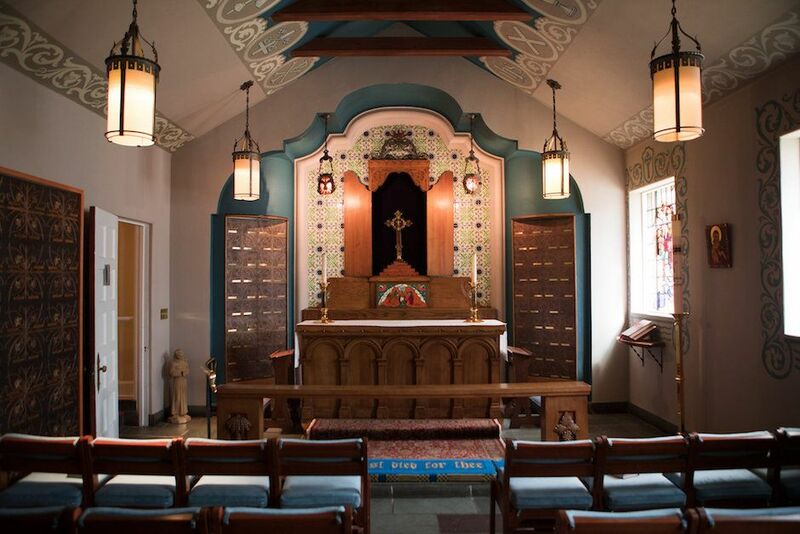 Going to an Episcopal Church or any church at all for the first time may feel a little strange and intimidating. We want you to be able to relax and feel welcome and able to participate as you choose. Here is a guide to some of what you can expect when you come to worship with us. We recommend arriving a few minutes before the service so you can get yourself settled. There will be ushers to welcome you and provide you with a service bulletin. You can sit anywhere you would like. In the rack in front of you in your pew, you’ll notice two books: The Book of Common Prayer, (sometimes called the BCP or Prayer Book) that has a red cover and contains the services of the Episcopal Church and The Hymnal 1982 which has a blue cover and contains worship music. Both books are used during the service. Once you are settled in your pew, open the BCP to the correct page as cited in your bulletin and place it beside you in the pew. These pages are marked “BCP” in your bulletin. Then open the blue hymnal and find the first hymn cited in the bulletin. If an “S” precedes the Hymn number it designates that this is standard service music. It can be found in the front of the Hymnal. A few minutes before the service, the organist will play the Prelude. This music is meant to help us center ourselves and prepare for worship. You’ll know it’s time for the service to start because you’ll see the Crucifer (Cross Bearer) standing at the rear of the church. When the first hymn begins after the Prelude, everyone stands. You’ll notice that people bow when the cross passes their pew. This is an acknowledgment that Christ is with us during worship and goes with us as we leave the church and enter the mission field. The remainder of the service is divided into two parts: The Liturgy of the Word and The Liturgy of the Table. The Liturgy of the Word contains readings from the Bible, the sermon, statements of our faith (The Nicene Creed), and Prayers of the People. 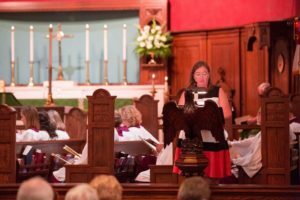 All of the biblical readings used in an Episcopal service are part of a set “lectionary” which assigns readings for every Sunday on a three-year cycle. Other Protestant denominations and the Roman Catholic Church also follow the same set of readings. Members of the assembly usually read the first two readings and the psalm. A priest or deacon reads the Gospel. You will notice that the reading of the Gospel (meaning “good news”) gets special attention. This is because the four Gospels of Matthew, Mark, Luke, and John contain the story of the life, death, and resurrection of Jesus Christ and are central to our faith. Normally a hymn welcoming the Gospel is sung, and the Gospel book is brought into the middle of the assembly and read by a priest. Everyone stands for this reading and turns and faces the Gospel Book. During the Gospel reading, Matthew, Mark, Luke, and John are looking down on us from the Great Dome. 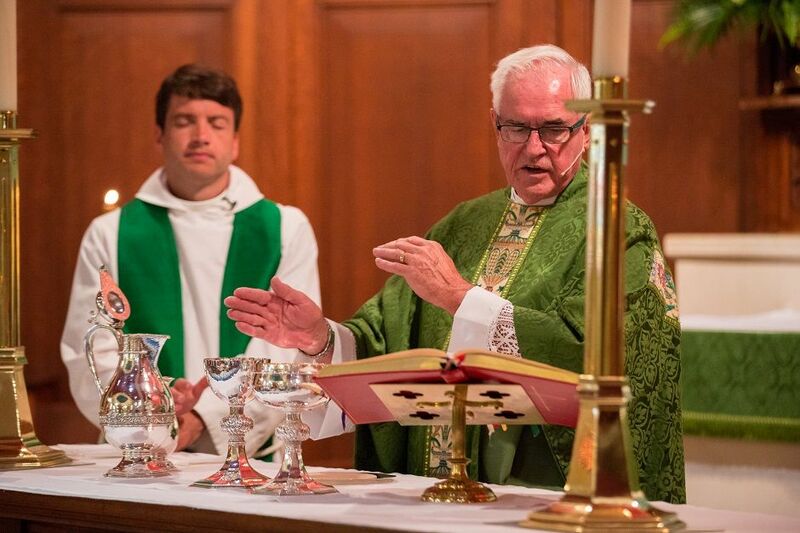 Following the Gospel, a sermon is preached by the priest. The sermon is meant to take what we have heard in the readings and engage those learnings with the everyday events that we experience in our lives. 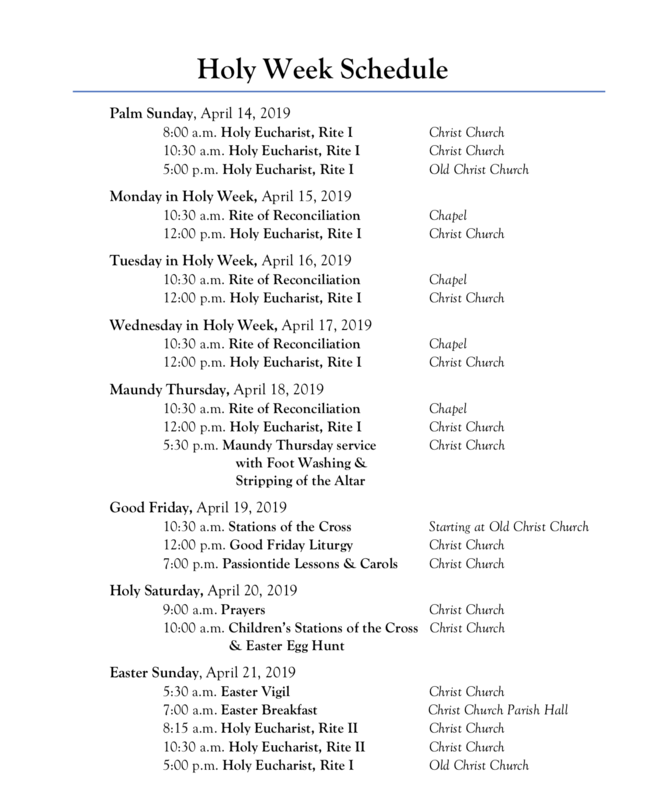 After the sermon, we stand and say the Nicene Creed, an ancient statement of faith used by most Protestant churches which bind us together with Christians of all generations and Christians all over the world. A member of the church comes forward after the Creed to read the Prayers of the People. These are petitions that include prayers for the Church, the world, the nation, those who are sick and those who have died. The priest concludes these prayers with a ‘collect.’ A Collect is a prayer that ‘collects’ all of our thoughts and prayers together and is prayed by the priest on behalf of all present. After the Prayers of the People, we say the Confession. The Confession is an opportunity to confess together all of the ways we have not loved God or others. 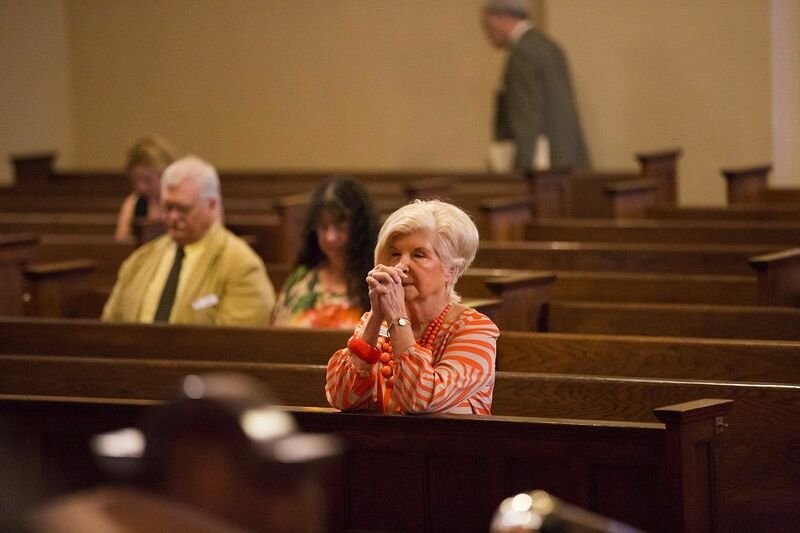 At Christ Church, we kneel for the confession as a sign of penitence. However, you may sit if you find kneeling difficult. At the conclusion of the confession, the presider stands and says the Absolution, which serves to remind us that God forgives our sins. The presider then bids “The Peace.” This can be an awkward moment for people who are newcomers. Ritually, what we are doing is enacting our need to be in right relationship with one another before we go to communion. We do that symbolically by saying “Peace be with you” and shaking hands. At the Peace, you should greet the people immediately around you. This portion of the service has as its focus the celebration of the Eucharist or Holy Communion. It includes the collection and presentation of your gifts and offerings, setting the table for the Eucharistic meal, and the Eucharistic prayers. After the elements (bread and wine) are blessed, we share a meal together as the Body of Christ. At the Eucharist, the Celebrant prays an extended prayer on behalf of God’s people. It starts with a dialogue between the priest and people called the Sursum Corda (Latin meaning “Lift up your hearts”). The Celebrant then praises God for God’s action in our lives. This section concludes with the Sanctus “Holy, holy, holy,” a response usually sung by all the people. The prayer continues with a retelling of the story of the Last Supper and the Celebrant asking the Holy Spirit to come into the bread and wine and into us. The people stand at the beginning of the Eucharistic Prayer. After the Sanctus (Latin for “Holy”) the people of Christ Church kneel or continue standing. Either one is fine. If you do want to receive, hold out your hands out palms crossed and the priest will put a piece of bread in your hand. Then another liturgical minister will come with the cup of wine (and it is wine!). There are a few choices here. You can eat the bread when it is put in your hand and then take a sip of wine from the cup. It is helpful for you to touch the cup and help guide it to your mouth. If you don’t want to drink from the cup, you can also leave the bread in your hand and dip the bread in the wine and then place it in your mouth. It is also fine to receive only the bread or only the wine; either is considered a full receiving of communion. Once you have received, simply return to your seat. 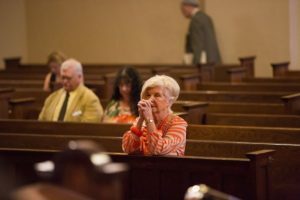 Often music is sung during or near the end of communion. When everyone has received communion and have returned to their seats, the Eucharist ends with a Post-Communion Prayer said by all present. The priest then gives the Blessing which asks God to bless each of us as we go out into the world; our mission field. Another hymn is sung by everyone as the acolytes, choir, and priests process back down the aisle and out of the church. At the end of the hymn, the people are dismissed by a priest or deacon.